Former California Governor Arnold Schwarzenegger visited the Fiji Pavillion in Bonn, Germany at the COP23. 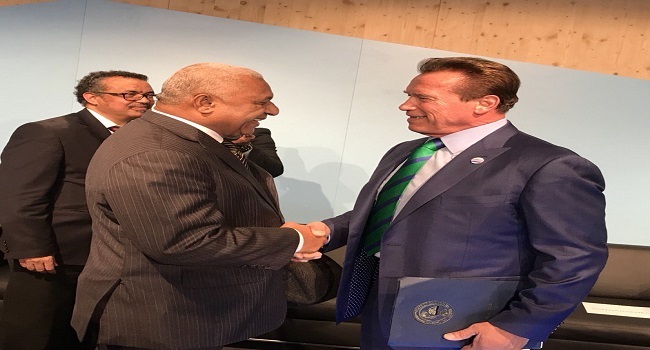 The Terminator star was given a tour by Prime Minister and COP23 President Voreqe Bainimarama. And Schwarnzenegger took to the Fijian hospitality, dancing and drinking yagona. Both men participated at a high level side event that links health issues to climate change. Prime Minister Bainimarama thanked the former Californian governor for publicly supporting calls to bring health to the forefront of climate change discussions.